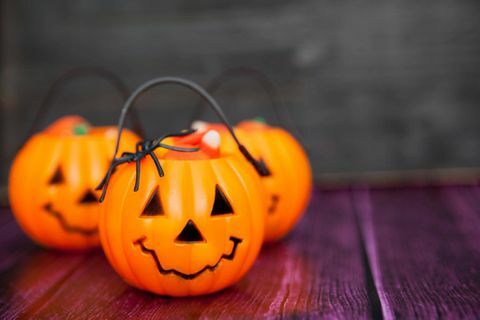 Changes to a controversial Halloween bylaw that banned trick-or-treating for older teenagers and set an early curfew on the pursuit of sugary loot don’t go far enough, the deputy mayor of a northern New Brunswick community says. Changes to a controversial Halloween bylaw that banned trick-or-treating for older teenagers and set an early curfew on the pursuit of sugary loot don't go far enough, the deputy mayor of a northern New Brunswick community says. "I wanted to demolish it altogether but I got outvoted," Kim Chamberlain said in an interview on Tuesday of the Bathurst city bylaw that made it illegal for teens over the age of 14 to parade door to door dressed as ghosts and goblins and set a 7 p.m. cut off. "At least we were able to make some modifications." The new rules – expected to pass third reading in early October – forbid anyone older than 16 from trick-or-treating and extends the curfew to 8 p.m.
Those caught with a "facial disguise" in public after curfew – such as a zombie mask or witch's veil – or anyone over 16 found roaming the streets for treats can be fined up to $200. Ms. Chamberlain called it an overreach for city councillors to impose Halloween rules, noting that homeowners can turn out their porch lights if they don't want trick-or-treaters past a certain hour. "It's silly," Ms. Chamberlain said. "If I have a trick-or-treater knock on my door at 8:30 p.m., I'm not going to say no." She said some parents work until 6 p.m. or later and that they need time to make supper and cajole young children into costumes. "At least we made some changes to accommodate parents who are working later so they at least have time to feed their children and dress them up before they go trick-or-treating," Ms. Chamberlain said. But she expressed concern about teens being questioned for dressing up or asking for candy. "Some kids are tall," she said. "My cousin's son is 5-4 and 15 years old. What are we going to do, go up to him and ask him 'How old are you' and 'Show me your ID?' That doesn't make sense." Bathurst city spokesman Luc Foulem admitted the rules are a bit "kooky," but said no one will be out running after kids on Halloween. He said older residents were concerned about "troublemakers" and that the goal is to ensure public safety. No one has ever been fined under the city bylaw, Foulem added. The first iteration of Bathurst's Halloween bylaw was brought in after a troubling rash of Halloween-night mischief. Chamberlain said older kids were actually stealing candy from younger kids, something she argued can be dealt with by parents and police without a specific bylaw. Meanwhile, the bylaw also sets out that Halloween is celebrated on Oct. 31. Some New Brunswick communities have in the past moved spooky celebrations to Oct. 30 when Halloween falls on a Sunday.